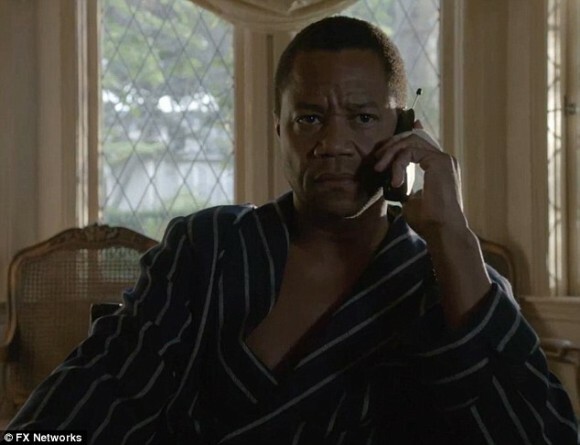 My Daily Mail review of the addictive new miniseries the People vs. O.J. Simpson: American Crime Story. It’s a hoot! Almost like the ‘trial of the century’ itself, this new 10 episode miniseries is a wildly thrilling and absurdly funny guilty pleasure with every salacious detail exaggerated and surprise twist exploited for dramatic flair. Whether you remember every second of the O.J. Simpson murder trial, or can’t pick Judge Ito from AC Cowlings, you’ll be sure to be entertained by The People vs. O.J. Simpson: American Crime Story. It begins the June 1994 night Nicole Brown Simpson and Ron Goldman were brutally hacked to death in the upscale Brentwood section of Los Angeles. Cops, including the soon to be infamous Detective Mark Fuhrman (Steven Pasquale), arrive at the scene and realize the female victim is the former wife of football legend turned movie Star O.J. Simpson (Cuba Gooding, Jr.). Cuba Gooding Jr. (left) plays O.J. Simpson in the upcoming miniseries The People vs. O.J. Simpson: American Crime Story on FX.